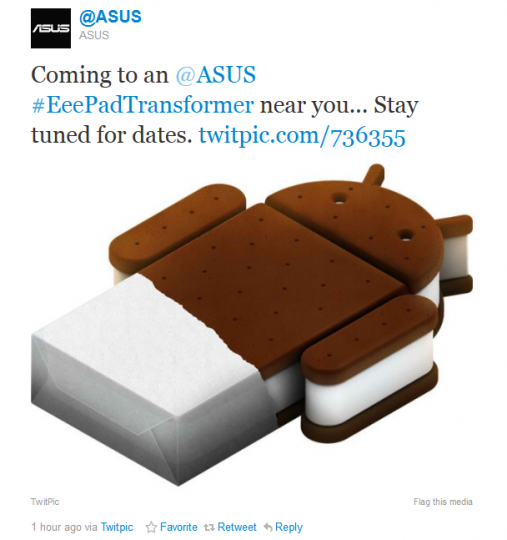 Okay, so I know this isn’t really anything new because we’ve all been hinting at this well before ICS was officially announced, but today ASUS has officially told everyone over on Twitter that the ASUS Eee Pad Transformer will be getting Android 4.0 Ice Cream Sandwich soon. We heard a few rumors yesterday, but they themselves have confirmed the good news today. If you’ve been following @ASUS you’ve probably seen a few awesome tweets from them lately, including the recently released Transformer 2 teaser video. Apparently ASUS will now be calling it the Transformer Prime (genius huh?) and it will be coming with ICS and a Kal-El quad-core processor from NVIDIA in the form of the Tegra 3. We’ve heard rumors that ASUS was working closely with Google to be the first tablet with Android 4.0 Ice Cream Sandwich and while we still aren’t sure what tablet will launch with it first, most likely it will be the Transformer 2 shown off on stage last night, and that will be formally announced on November 9th. Most likely Android 4.0 Ice Cream Sandwich will be arriving on a few tablets like the original Transformer, Xoom, and others once the code is released. We’ll be hearing plenty more on ICS tablets in the coming days and weeks so get ready.